A new deal every day from Audible. Today’s deal ends 07/10/2018 @ 11:59PM PT. 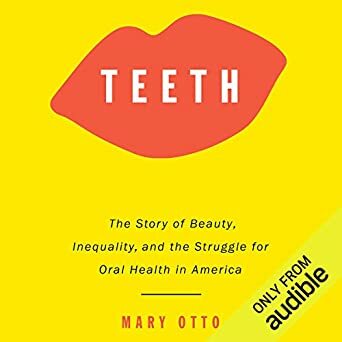 In this shattering new work, veteran health journalist Mary Otto looks inside America’s mouth, revealing unsettling truths about our unequal society. Teeth takes listeners on a disturbing journey into America’s silent epidemic of oral disease, exposing the hidden connections between tooth decay and stunted job prospects, low educational achievement, social mobility, and the troubling state of our public health. Otto’s subjects include the pioneering dentist who made Shirley Temple and Judy Garland’s teeth sparkle on the silver screen and helped create the all-American image of "pearly whites"; Deamonte Driver, the young Maryland boy whose tragic death from an abscessed tooth sparked congressional hearings; and a marketing guru who offers advice to dentists on how to push new and expensive treatments and how to keep Medicaid patients at bay. Otto also goes back in time to understand the roots of our predicament in the history of dentistry, showing how it became separated from mainstream medicine, despite a century of growing evidence that oral health and general bodily health are closely related. Muckraking and paradigm-shifting, Teeth exposes for the first time the extent and meaning of our oral health crisis. It joins the small shelf of books that change the way we view society and ourselves – and will spark an urgent conversation about why our teeth matter.